Arsenal are understood to be keeping a close eye on Cagliari midfielder Nicolo Barella ahead of a potential move for his services in the summer. The Italy international has been closely watched by Gunners scouts this term, and the most recent occasion occured during Cagliari's 2-0 defeat to Juventus on Tuesday night. According to The Mirror, the north London side are yet to decide on whether to make an approach for the 22-year-old, who is generally a holding midfielder by trade. Barella is currently valued at around £43m by the Serie A club, and it is suggested that any summer move from the Gunners may be dependent on their qualification for next season's Champions League. Arsenal are presently said to be working on a limited £45m budget for the summer, but that transfer kitty could be enhanced with the club sealing a top-four spot or winning the Europa League crown. 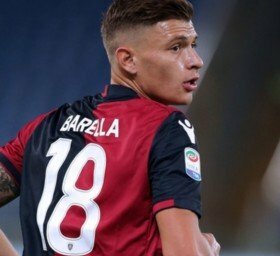 Barella has made nearly 100 league appearances for Cagliari since making debut four years ago. He has managed five caps with the Italian national side to date.